Fast Prep Herb Shears 7-inch: “This streamlined, dishwasher-safe design makes it easy to chop vegetables, herbs and even meat directly into the bowl, no cutting board required.” Additional description same as above (5-inch model). Test Kitchen Overview: We have said it before and we will say it again: every kitchen needs a good set of scissors or shears. Along with tongs, they are the unsung heroes. Perhaps you have a collection of wooden spoons, a spatula or two and some knives. You need to branch out! We use our scissors for snipping herbs, opening packages, cutting strips of parchment for lining pans, cutting parchment for triangles and possibly our favorite use is for trimming pie dough to aid in creating a neat edge. Not a day goes by in the Test Kitchen when we don’t reach for our scissors. In a perfect world we would have at least two, reserving one for paper and one for food. Just like knives the most important thing is that they are sharp and well made. Dull tools not only do not work, they are dangerous. In the past we have used scissors purchased any old place and haven’t used scissors specifically meant for the kitchen. That changed when these Fiskars came to the Test Kitchen. We tested 3 models, all meant for the kitchen and the quality and craftsmanship had us looking for more ways to use them! I have small hands so I had others with much larger hands work with them as well for a more balanced review. (We tested a right-handed model of the All-Purpose Kitchen Shears and the testers were all right handed. 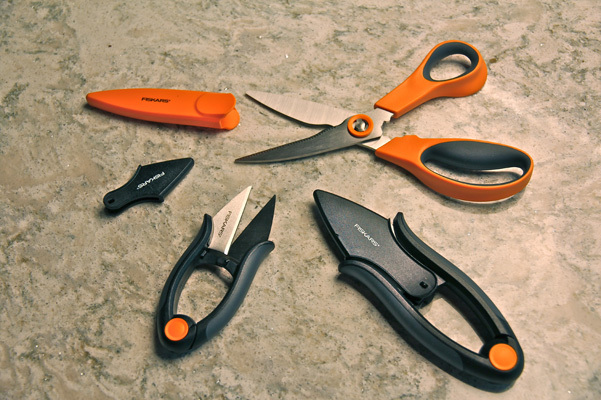 Note that Fiskars makes left handed models and also note that the 5-inch and 7-inch Fast Prep Herb Shears work equally well for lefties and righties). Pros: A few features jumped out at us immediately, primarily that all of these are dishwasher safe, which is so important for kitchen sanitation, that they all come with sheaths for storage and that they are backed with a lifetime warranty. And here’s another thing that might seem silly, but we didn’t need a strong set of shears to get the packages open! We had just re-watched the Curb Your Enthusiasm where Larry David goes to buy box cutters because he has a package that he can’t open. When he gets home he realizes that he needs a pair of box cutters to open the box cutter package. The irony hit home; we have had this experience. 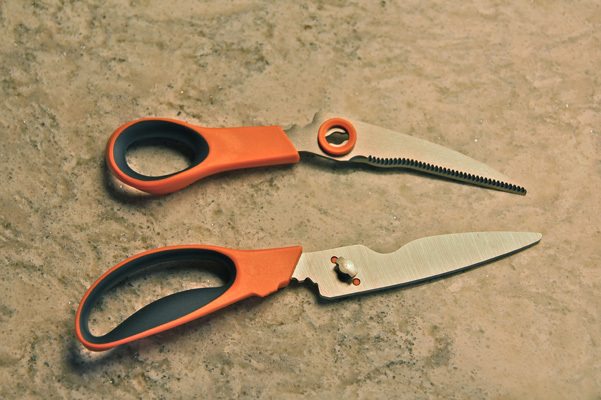 The Fiskars folks have secured their scissors and shears in very well thought out packages that present them safely, allowing you to see them front and back, and yet we were able to open the packages easily with our hands. 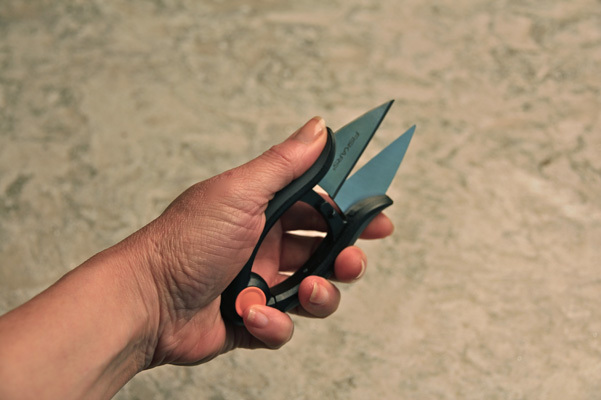 The Fast Prep shears work equally well for right and left-handed cooks. We assumed the 5-inch size (seen above) was going to be a bit undersized for our extra-large handed tester, but it worked very well for all of us. Surprising and a testament to good design. We loved the ability of the All-Purpose Kitchen Shears to come apart for cleaning. They lock together very well and very safely so we didn’t even give this a thought during use. They feel secure and they are secure. None of our previous scissors had come with sheaths and we appreciated this extra. It allowed us to store the scissors in a drawer knowing the blades would be protected and any hands rummaging around would be safe, too. We knew we would use these for herbs, parchment paper and trimming pie dough, as mentioned previously, but the blades are so sturdy and sharp we found ourselves using them for other tasks as well such as cutting up kale for smoothies, trimming fresh flowers for cake decorations, cutting raw and cooked bacon, cutting pizza, using to “chop” peeled tomatoes right in their can, to “dice” dried fruit, snipping marshmallows into the sizes we need and possibly our favorite use – using scissors to slash vents into pie dough…everyday we are coming up with more uses. Cons: None. These tools are well made, inexpensive and readily available. 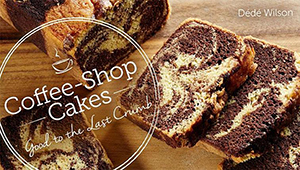 They make a great gift, too, for the cook or baker who have everything. 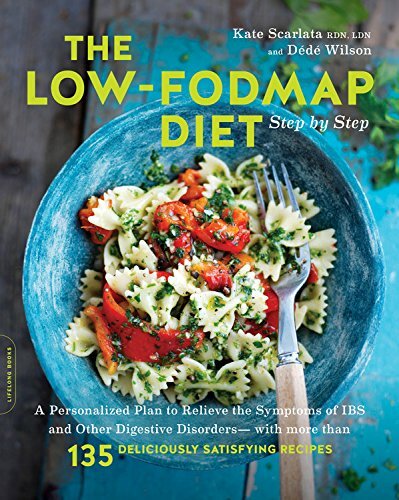 Suggested Use: See above. Just have them at hand and you will use them constantly. We recommend at least two pairs: one for food and one for non-food items. Where to Buy: You can buy these through Amazon, retail outlets and from Fiskars directly. Price at Time of Review: $12.99 for the 5-inch Fast-Prep, $17.99 for the 7-inch Fast-Prep and $24.99 for the All-Purpose Shears.